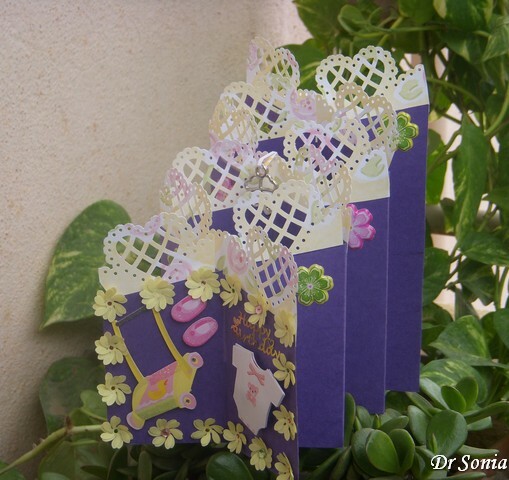 The basic 3 D pram is surprisingly simple to make .You need just 2 large circles, 4 small circles and a rectangular card strip to join them to make a pram shaped box. 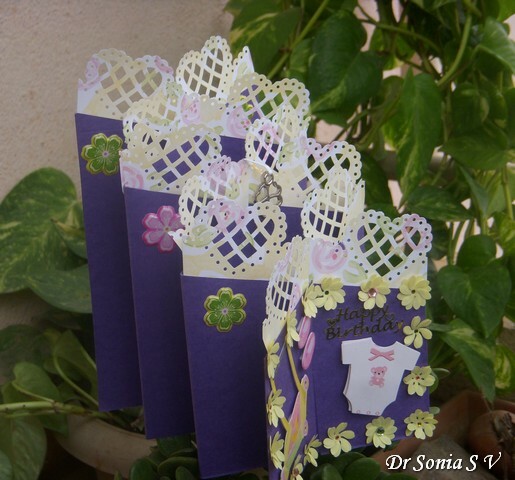 Crafting with my kiddo got easier after I got my Big shot and we end up recycling even more as now even my little one can easily cut up boxes and thick card using the machine. 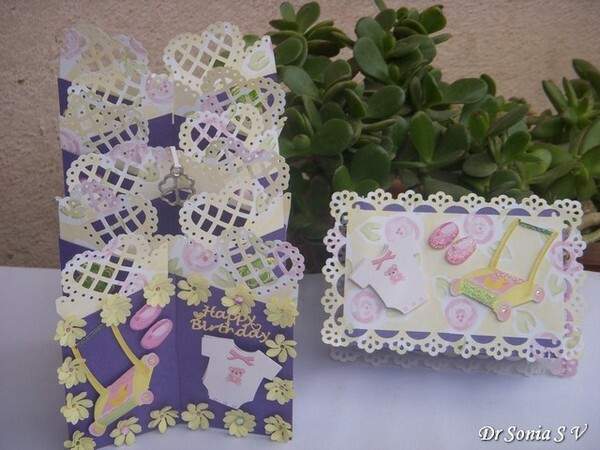 Here you can see my little one using scallop circle dies and the Big Shot to recycle an old card to make her Pram! 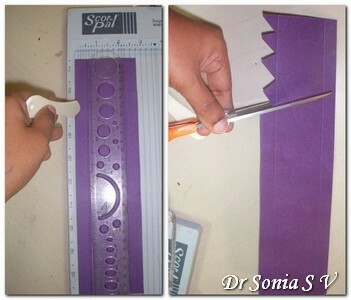 To make the pram body take a strip of sturdy paper :My paper strip is 2.5 inches x 11 inches. 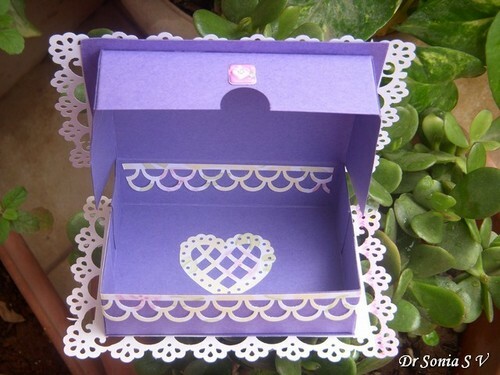 Width -will depend on how wide you want the box compartment to be. Length- depends on how big your pram circle circumference is!Roughly roll it around the circumference of your pram [3/4 circle] to see if you have enough length for your pram box! 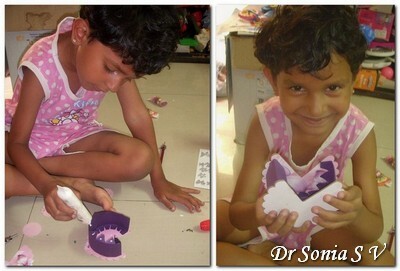 Fold over the zig zag teeth and apply glue on all the zig zag teeth on one edge as demonstrated by my little one! 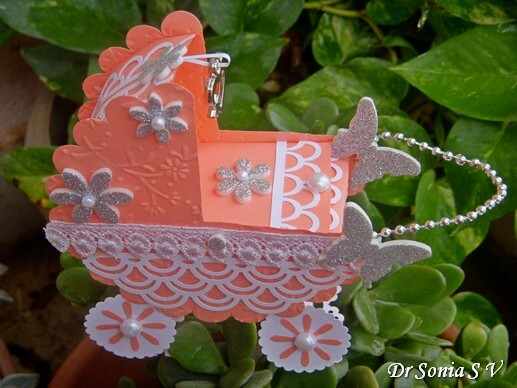 Glue the zig zag teeth to the inner surface of your pram circle. This is quite easy if you have an extra pair of helping hands--you can see the tiny fingers helping to hold the zig zags as they dry ! 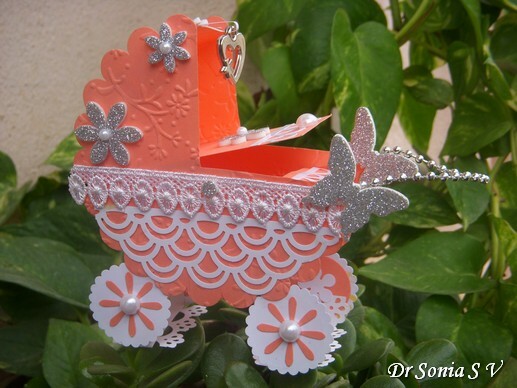 Snip off the extra length of paper if you have more than the circumference of your pram or just bend,fold and glue it in as a horizontal shelf for your pram box. Once one side has dried a bit ,apply glue on the other row of zig zag teeth and glue to the other 3/4 circle just inside the edge. Getting it perfect is tough for little ones so our Pram is not all that symmetrical but I guess the smile on a little face compensated for that! 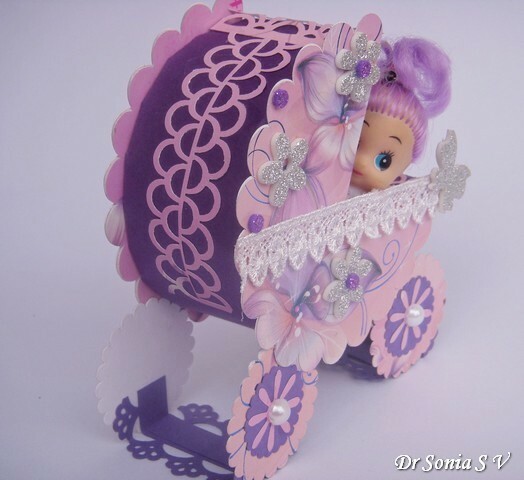 Stick on the wheels on the outer surface or inner surface of the pram . Glue gently wheel by wheel so that all wheels touch the ground when the pram stands. 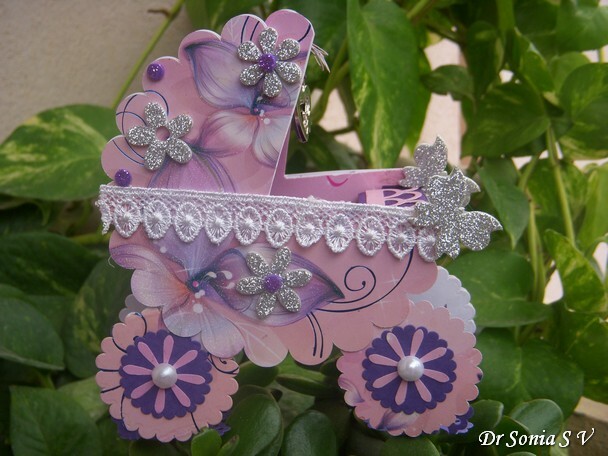 Glue card strips as shown inside the wheels to act as additional supports [ the paper wheels by themselves wont take much weight] so that it can take a bit of weight without toppling over when you put your goodies inside the pram box. 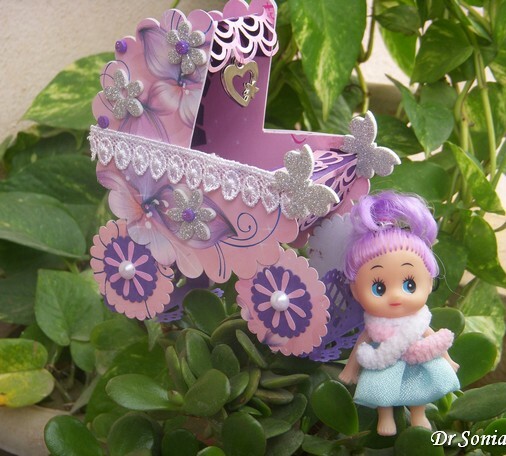 I didn't add a lid for this one as my daughter wanted to keep her dolly inside but attaching a lid as in my first version of the pram box just involves gluing a piece of card stock inside the pram and letting it overlap on the ledge already made. 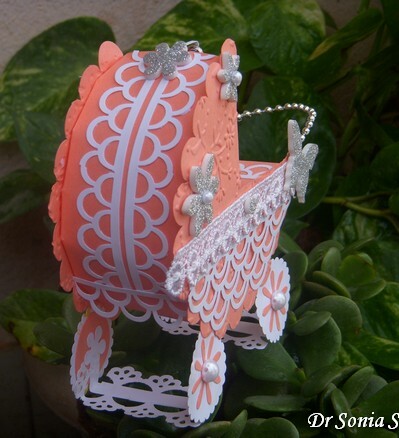 I used MS punches for a lacy effect and hung a heart charm from the roof of our pram . 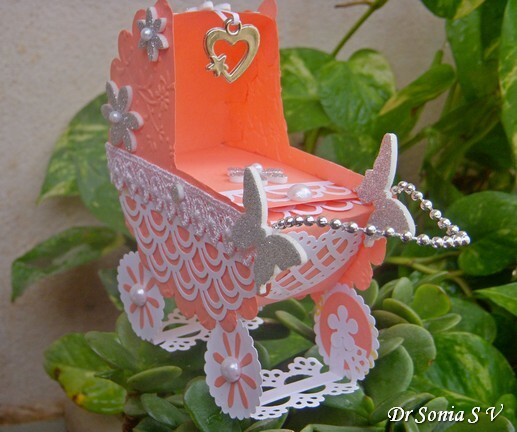 We used glittery foam flowers and butterflies again as my little one didn't want much variation from our first pram shaped box . 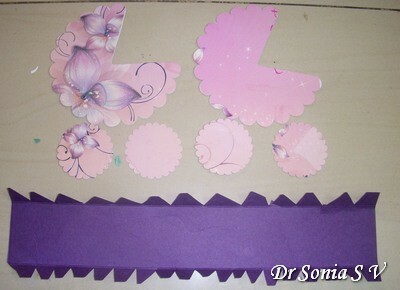 I hope you enjoyed my daughter's pink and purple overdose [her fav colors of the moment ! 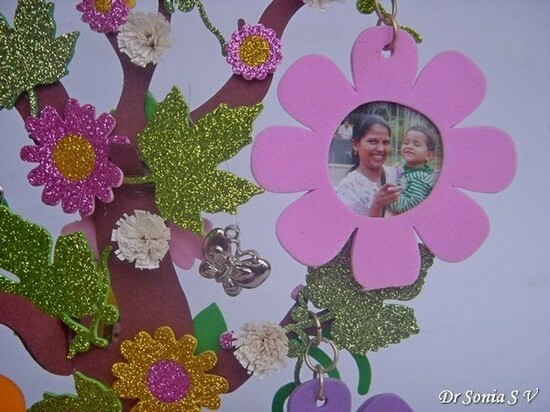 ].Do share your views as my kiddo has become quite an ardent blogger and is keen to read comments too! 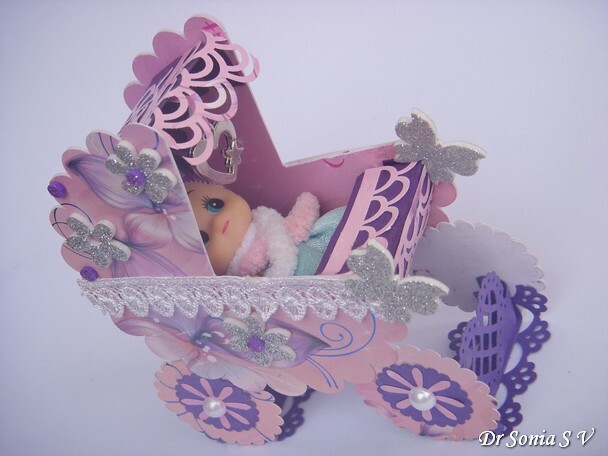 Links to some awesome Prams and tutorials: Loz, Michelle, Suzie. 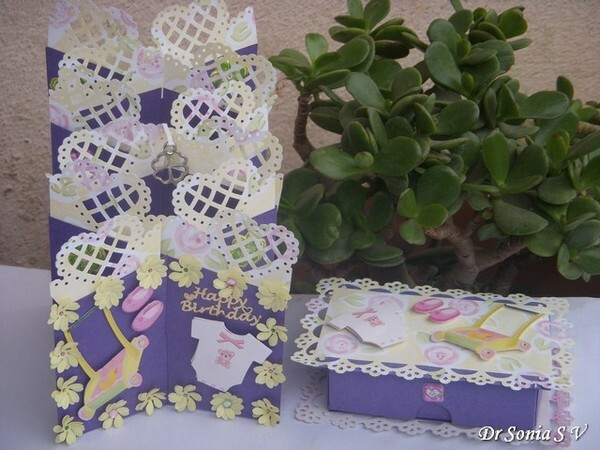 I find making shaped boxes fascinating though often challenging.However it was surprisingly easy to make this pram shaped gift box. 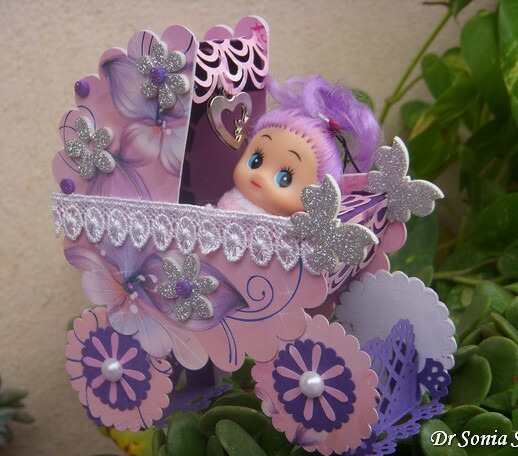 The inside flap of my pram has a pearl to help open the lid of the pram box . 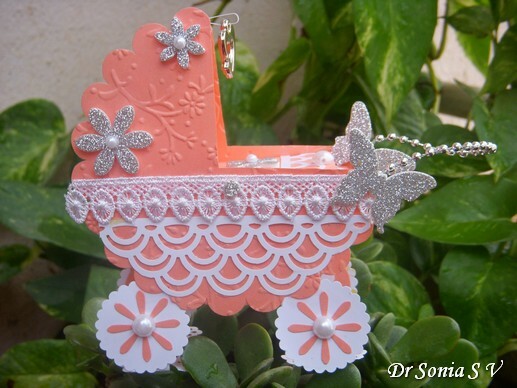 Used MS border punches,glittery foam flowers and butterflies to glamorize my pram box. 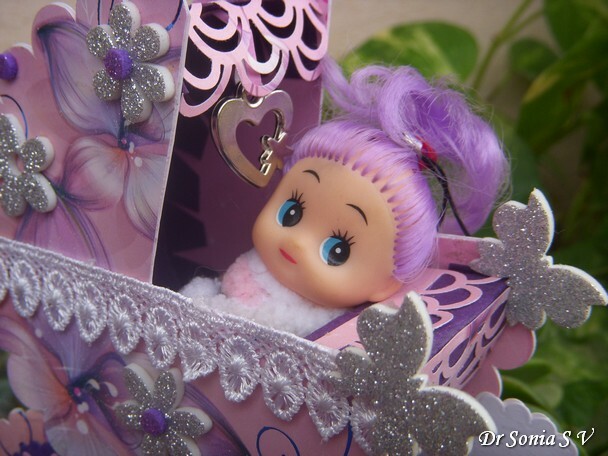 Hung a heart shaped metallic charm like a mobile on the roof of the pram shaped box. 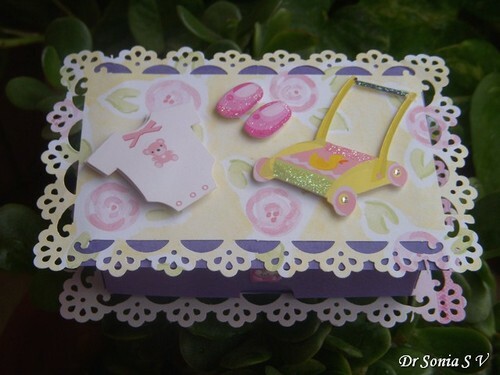 My most talented friends Loz and Helen are the inspiration behind this Pram shaped box and their versions are much superior to mine so do drop over to their blogs to be enchanted. 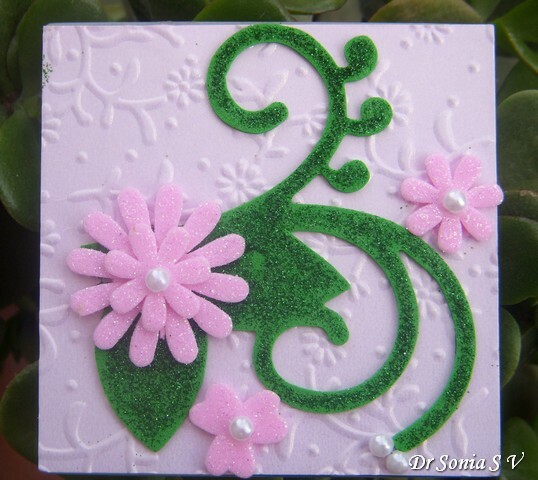 Sometimes we all get into the mood to create something simple and quick yet beautiful isnt it! 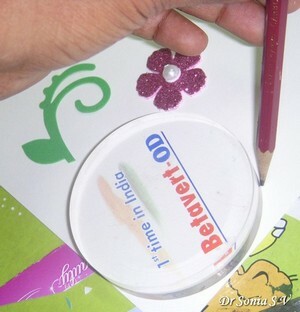 Altering something is often such a quick yet rewarding craft! 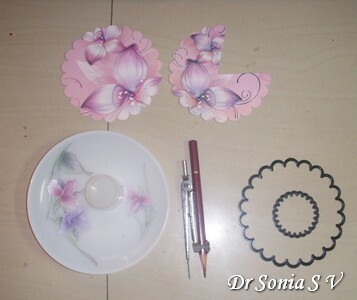 I had these paper weights with some drug company's names on them and though I didnt like how they looked, they were too good to throw away so I decided to try alter them! This was a super quick yet enjoyable altered project ! 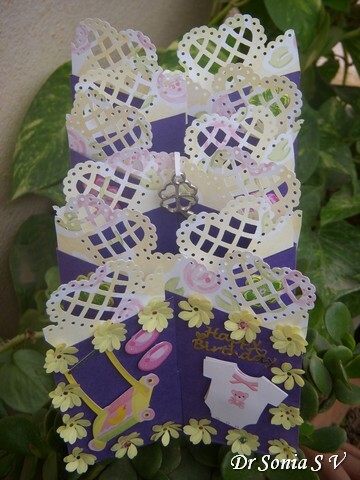 Sometimes even if hours is spent on a card or project the only reaction I get at home is a "ummm!" 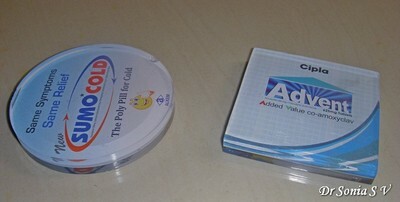 Well these paper weights surprisingly received a lot of oohs and wows from all at home ! 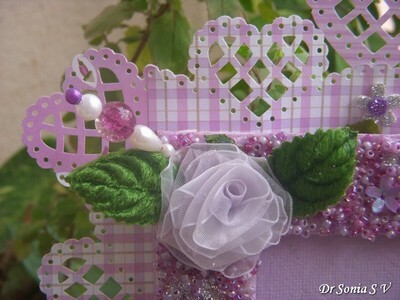 I guess what appeals to us as crafters are techniques and complicated stuff while to a non crafter the overall beauty appeals! What do you say friends? 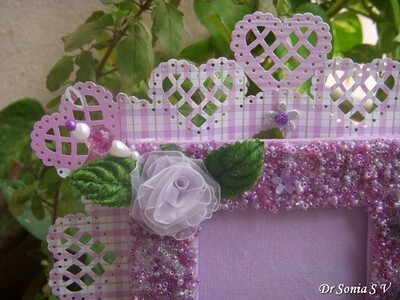 Photo frames have held such a special attraction for me even before I started crafting and making my own ! 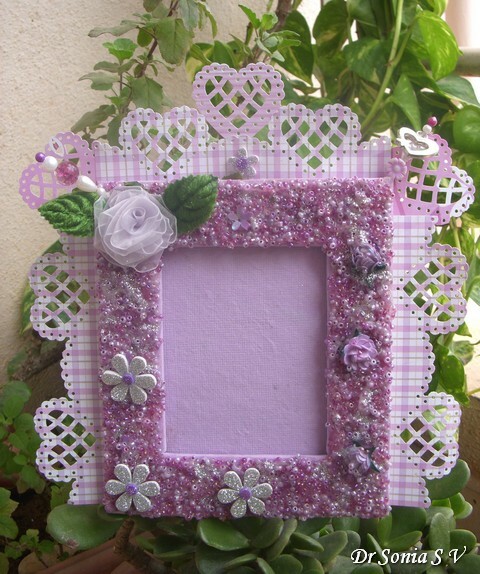 Recently I picked up a Photo frame kit for my daughter from my local craft shop[Itsy Bitsy]. 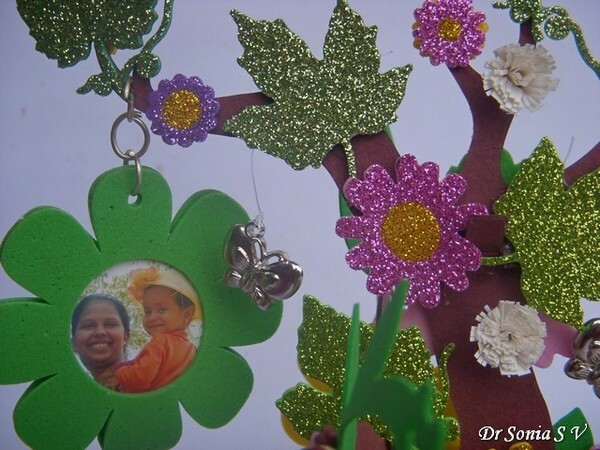 My kiddo had fun sticking the parts of the frame together and sticking the beads on the photo frame. 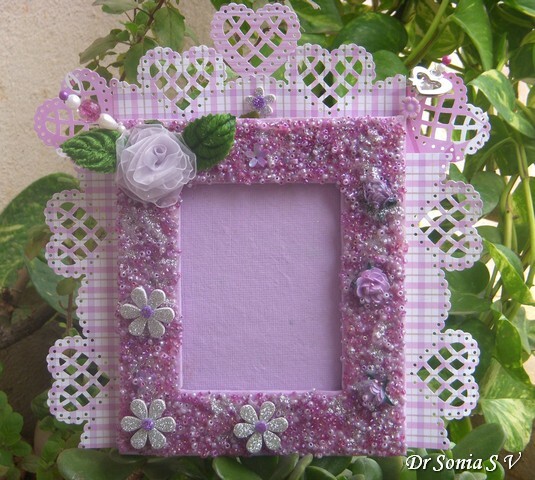 The kit yielded a simple beaded frame and of course we had to add our own special touches! 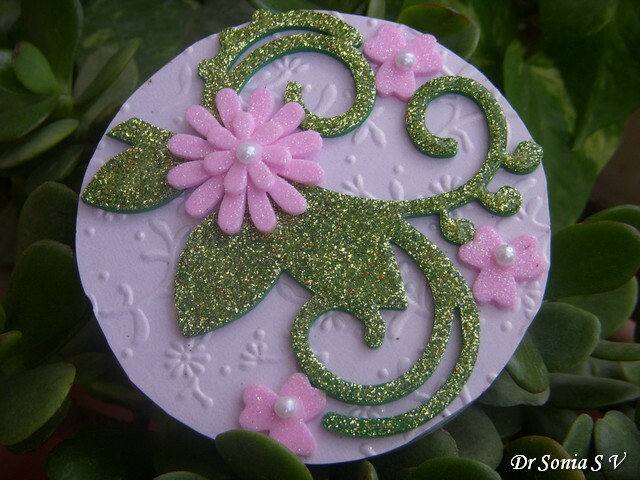 The shiny look is courtesy a generous coating of modpodge over the beads and this helped to really stick the beads which had a nasty tendency to keep falling off! 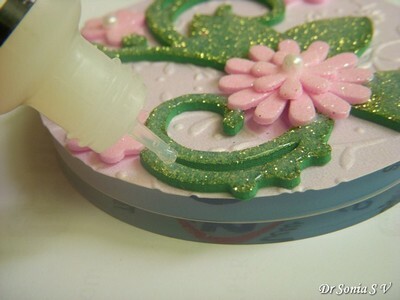 Also a bit of silver glitter glue here and there gave it a bit of sparkle and glamour! On a happier note ,I made my first ribbon rose !! 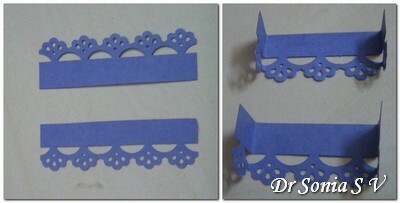 [So happy as fabric crafts and me dont get along usually!] Also made my first fancy pin by recycling beads from a broken bracelet . 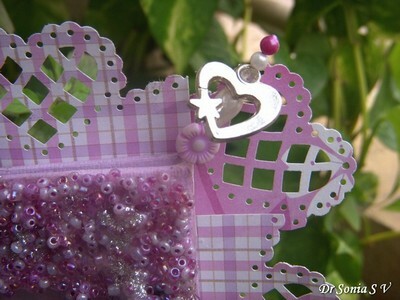 Our photo frame has a hearts theme so added a heart charm on another handmade pin using the trusty glue gun. 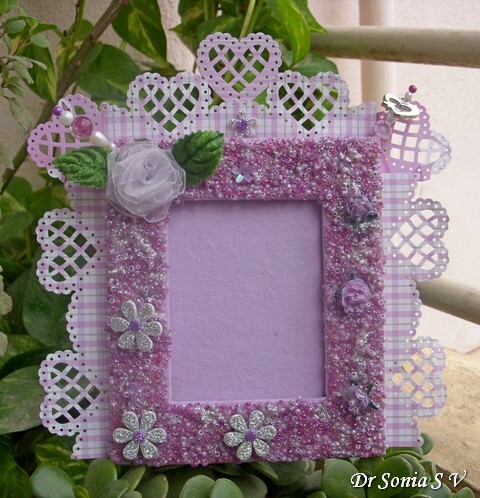 I hope you liked this glitzy photo frame..do share your views. 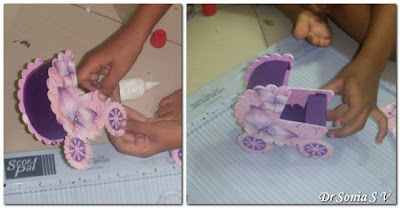 Crafting with young children requires a lot of time and patience and sometimes when you want to just laze around yet have fun, using a store bought craft kit is wonderful. 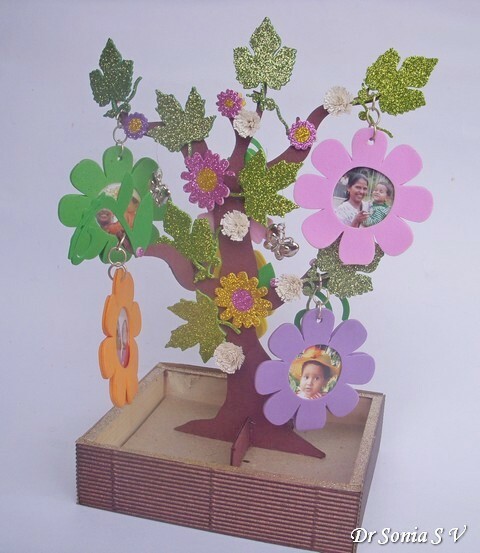 The kit came with a card board tree and foam flower photo frames. 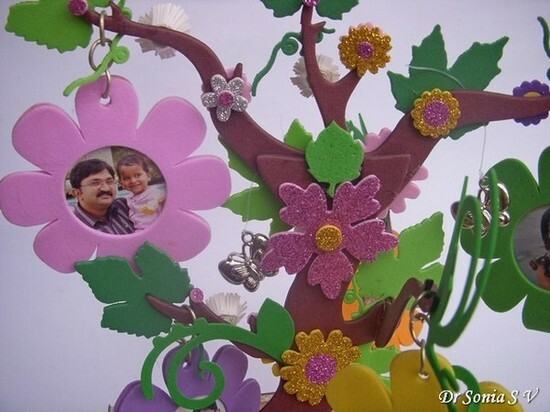 My little one had such fun choosing the photos to go on her tree. 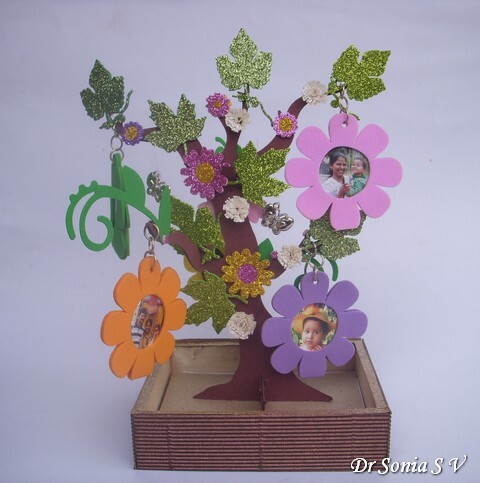 This is the other side of the DIY photo frame. 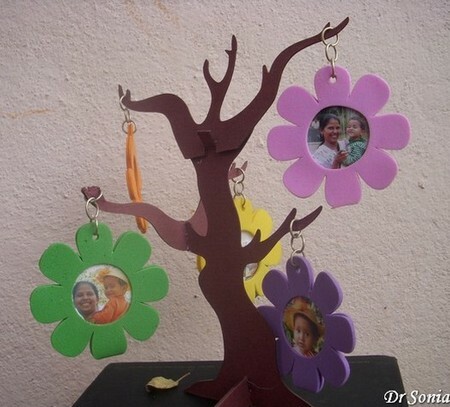 Each flower holds 2 photos and you can attach metal rings to hang them on the tree.I threaded some lovely butterfly charms [from Aditya’s Imaginations] on transparent twine and hung it on the branches. 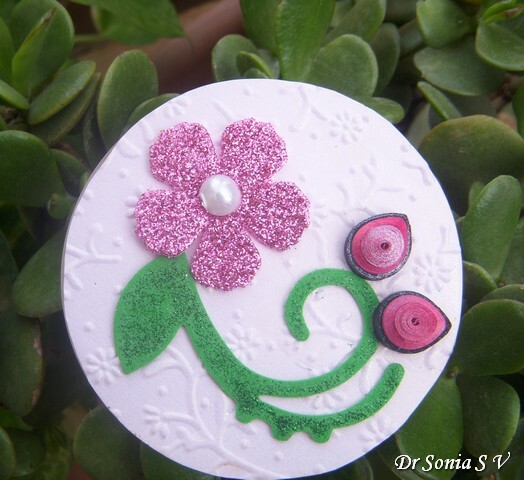 I wanted a bit of creamy white to balance all the colorful glitter so quilled some fringed flowers to go on the tree. 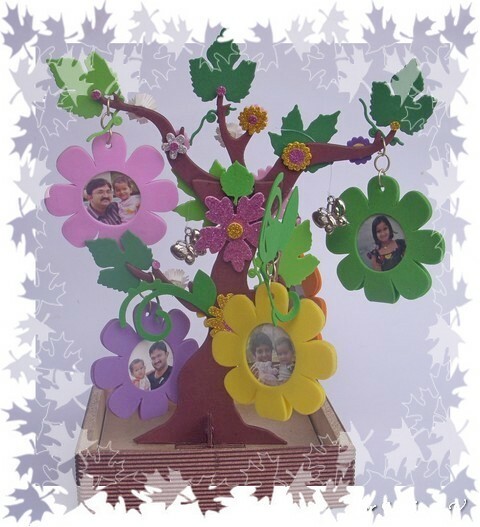 The fun part is that as the little flowers swing in the wind the view keeps changing on this handmade photo frame.